FIRESTORMERS: ELITE FIREFIGHTING CREW an exciting new middle-grade adventure novel by Carl Bowen. 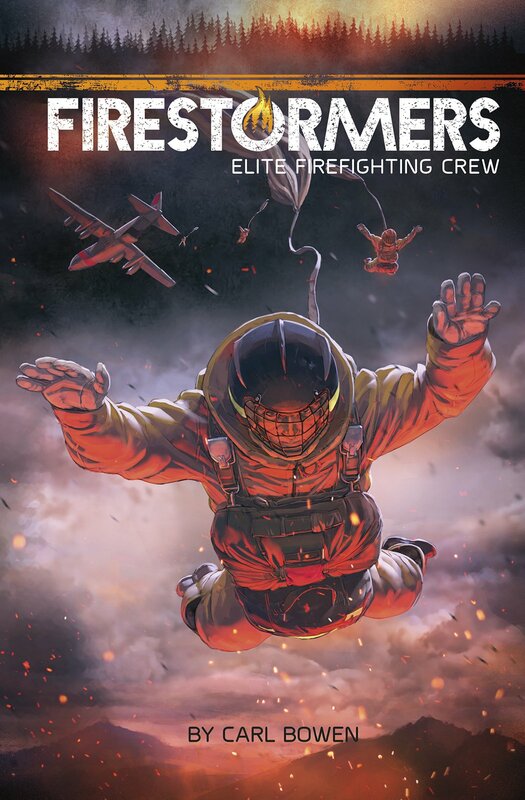 From the creator of the acclaimed military series SHADOW SQUADRON, comes the story of a new combat force fighting a very different battle: the war on wildfires. The National Elite Interagency Wildfire Rapid Response Strike Force recruits the cream of the crop from fire services nationwide—only those willing to fight infernos wherever they pop up. As the climate changes and the population grows, wildfires are increasing in number, size and severity. Only an elite group of men and women are equipped to take on these immense infernos: FIRESTORMERS! Like the toughest military units, they have the courage, the heart and the technology to stand on the front lines against 100-foot walls of 2,000-degree flames. Their gritty, life-or-death missions are sure to make any reader sweat. Bowen, who has a previous tightly woven thriller under his belt in Shadow Squadron: Elite Infantry (2013), tenders another taut piece of beyond-the-call-of-duty adventure. Here he introduces a cast that only rarely makes the headlines: firehotshots, smokejumpers, firestormers, or, as the government bureaucracy would prefer: National Elite Interagency Wildfire Rapid Response Strike Force—the SEALs of the forest fire fight . . . full of good shoptalk for daredevils and gearheads, excellent visualization (and forest-firefighting wisdom) than melodrama by a factor of five: "Fire flowed over a landscape like water—not downhill, exactly, but seeking out paths of least resistance." Bowen handles gender issues with a good degree of diplomacy and sophistication but is less successful with race, giving readers little reason to believe that any of his characters are anything other than white. He also introduces an ethical quandary regarding Humboldt marten habitat, making it an issue, not just a pesky indulgence. When the smoke clears, a group of characters emerges deserving a unique and universal respect.